Telecom service providers face considerable challenges as they try to balance the rapid and continuous changes in consumer behaviour, with the availability of new online services. At the same time, content providers rely on quick service response from their telecom partners. If telecom companies are slow to respond or lag behind their competitors, content providers are quick to look for new ways of accessing the market. In October 2015, the telecom operator announced the deployment of an upgraded version of their cloud VPN service, utilizing Cisco’s platform for SDN and NFVI technologies and the Cisco Network Service Orchestrator. It features automated orchestration via a customer portal that accesses YANG-modelled services through the NSO’s open NBI REST API. The solution went live in February 2016. The automation and orchestration part of the solution uses the Cisco NSO product as the orchestration engine. 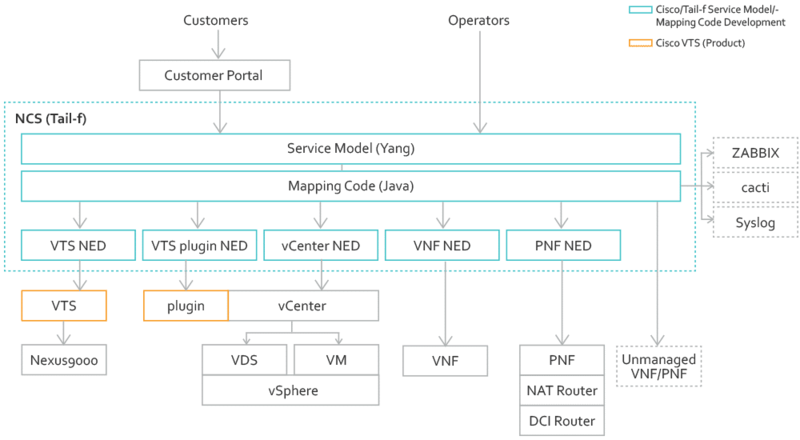 This platform is model driven (YANG) and allows a separation between the network’s service layer and its device layer. This enables networks to be programmed with device agnostic services. Accordingly, a device can be changed from one vendor to another without the need to break or change a service. In fact, the services are agnostic despite the fact that the network comprises a mixture of physical (PNF ) and virtual (VNF) networks, distributed across two geographically separated Data Centres. The orchestration solution is mainly divided into two major services, one for secure internet access and one for secure remote access. The customer can select between these services and configure them according to their needs, i.e. Bandwidth, QoS, value added Functions (e.g. Web security and mail security), etc. The configuration is then automatically mapped down to each individual device (physical or virtual). The input data is automatically validated before the settings are approved, eliminating typing errors, type definition correctness, as well as validity towards global system thresholds. This type of validation, in combination with the removal of manual intervention, minimizes the risk of costly faults in the network. Furthermore, the orchestration optimizes network resources by “spinning up” new virtual network functions when they are required. This ensures Data Centre resource usage is kept to a minimum. Thanks to the combination of Cisco products and Data Ductus orchestration design, the telecom operator can now make configuration changes to their services in minutes instead of days. Furthermore, they can do it without any OPEX involved, which provides them with considerable savings. Time to market has also been greatly improved as new services can now be designed without concerns about the complexity of the underlying network. New agile processes also add greatly to the speedy rollout of new services.